I thought I might take a break from the sweet stuff today and venture into the savoury baking world. I do often bake more than cake and other sweet treats. Well, maybe not often but sometimes! There is nothing like making a batch of hot, delicious scones on a wet and windy Autumn day. 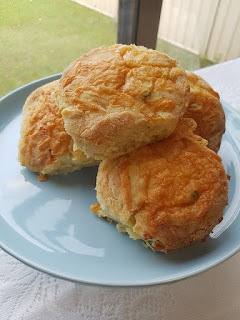 These scones are so simple and so delicious. Great to have on their own with butter or serve them with a nice piping hot bowl of soup. 1. Preheat oven to 180 degrees. Line a baking tray with baking paper. 2. Place flour, salt, baking powder and butter into the jug with the kneading blade. 3. Select Speed 11 for 30 seconds. 4. When the program is complete add cheeses and spring onions. Set Speed 6 for 20 seconds. 5. When complete, set Speed 6 for 30 seconds. Pour combined corn and milk in through the opening with the CC running. 6. Turn the dough out onto a well floured surface. This is a very sticky dough. Sprinkle flour on top of the dough and dust hands with flour. Pat the dough out to around 3cm thickness. Use an 8cm cutter to cut out the scones. (Don't ever use a glass to cut out scones as this compresses the dough and can stop them from rising well). Gather scraps up and pat out again and cut out remaining scones. You should get around 8-9 scones. 7. Place the scones very close together on the prepared tray and sprinkle additional tasty cheese on the tops.Bake for around 25 minutes in the centre of the oven or until well risen and golden brown. 8. Remove from the oven and enjoy hot with butter. NOTE: You can use whatever size cutter you choose to make more or less scones. Just be aware that the baking time will go up or down depending on their size. You can also use a sharp knife to cut them out in whatever size or shape you choose.